Blessings from the Battle, a newly-organized 501(c)(3), will present its first-ever, black-tie Masquerade Ball on Sept. 15, from 7 p.m. – 11 p.m., at the Clearfield Curwensville Country Club. 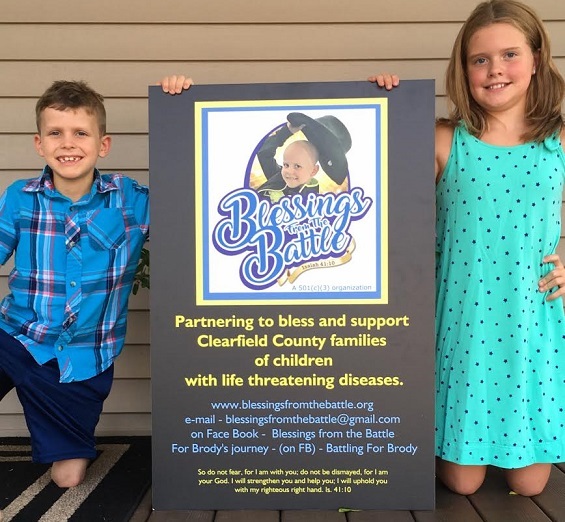 Blessings from the Battle Foundation was formed in honor of Brody Lanich, a 7-year-old Clearfield boy, who recently completed a two-year battle against the rare childhood cancer, neuroblastoma. After an exhausting life interruption for the Lanich family, Brody has been declared cancer free. “Most of your normal life gets put on hold while you help your child fight for his life,” shared Brody’s mother, Kristen Lanich. A year-and-a-half leave from her job as a Kindergarten teacher at St. Francis School placed immediate stress on finances. However, members of the Clearfield community opened their hearts and provided monetary support, meals, help with chores and home repairs and most importantly, prayer for the Lanich’s. “We were overwhelmed at the love and support we received, and we now want to partner with others to support and bless the many families of Clearfield County who also have children struggling with life threatening diseases,” she added. So many things overwhelm the family, for example yard work, car repairs, pet care, travel expense, grocery shopping and food prep. Families may also need counseling services and help paying for tutoring as attending school becomes impossible. Some suffer the inability later in life to have children and the Lanich family would love to help with adoption expenses. One more area the foundation hopes to support is with pediatric-specific supplies at local hospitals as well as better-coordinated protocol between major treatment centers and the local hospital. “Many businesses have provided support for our Masquerade Ball, and we are very excited to share the evening with everyone,” Lanich shared. The event features dancing with music by the 14th Street Jazz Band, heavy Hors D’oeuvres, two complementary drinks, close-up magic and Corn Hole, all included in the price of your ticket. Additional entertainment for suggested donation to the foundation includes Caricaturist ($5), Psychic/Palm Reader ($5), Putting Contest ($2), Chinese Lanterns ($2), Sparklers ($1), Chinese auction ($1) and Popcorn ($1). Tickets are on sale now for $30 each. Tickets are available at Jim’s Sports Center, Moena Restaurant, Clearfield County Career and Technology Center, Clearfield Curwensville Country Club, Curwensville Florist, Jessica’s Sense of Style, Universal Zen Spa, Joey’s Restaurant in Houtzdale or call 814-592-8370 or e-mail blessingsfromthebattle@gmail.com. “We invite individuals and businesses to partner with us to make our vision a reality for families faced with serious medical diagnoses. With donated, as well as raised funds, we can reinvest in the children and families of Clearfield County,” shared Lanich. To donate, make checks payable to Blessings from the Battle and mail to 498 E. Sixth St., Clearfield, PA, 16830.